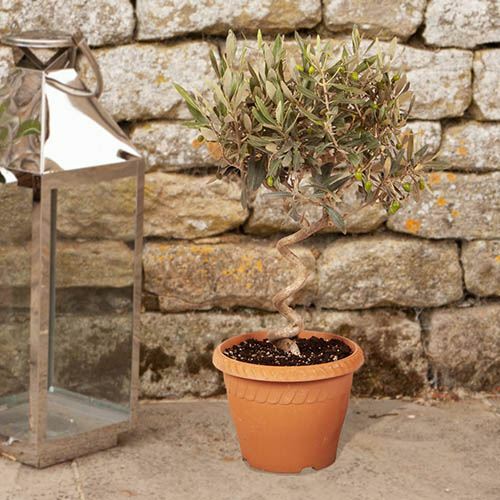 A twisted stem, miniature olive standard for your home or garden. 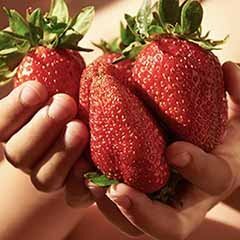 The perfect, long-lasting gift for gardeners and foodies alike. 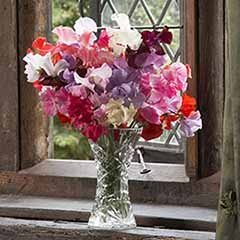 Perfect in pots on patios or on a bright kitchen windowsill. Lovely evergreen foliage for year round interest, plus gorgeous olives! 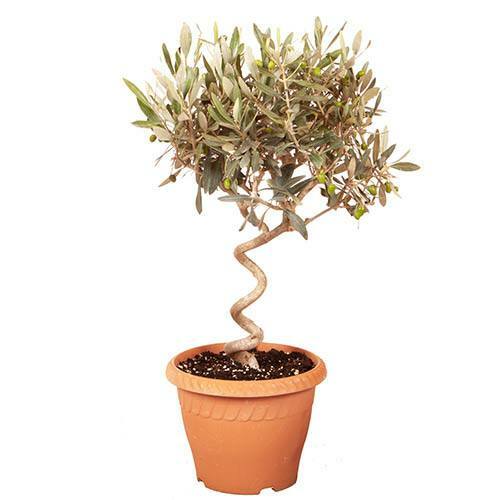 Supplied as olive trees 50-60cm tall inc pot, grown as a twisted stem standard form with olives forming, in a decorative terracotta-style plastic pot. 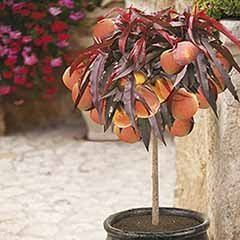 The perfect long-lasting gift for gardeners and foodies alike, these great little olive trees will look fab on patios, decks and balconies across the country. 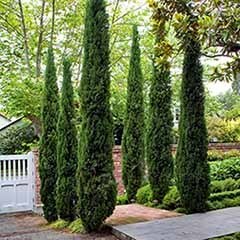 Their lovely evergreen foliage gives year-round interest, and adds an exotic Mediterranean holiday feel all year – the leaves have a silver underside to them, giving a two-tone effect to the whole plant. 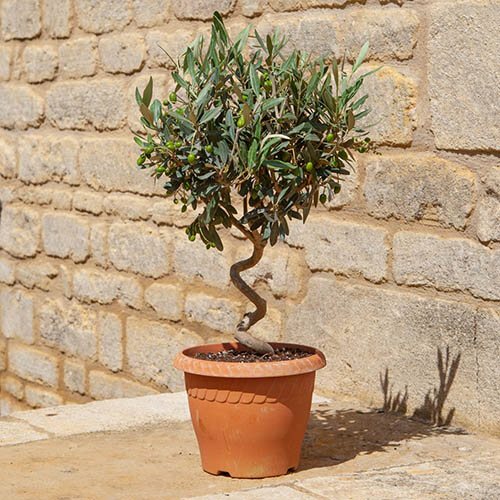 Growing olive trees in pots is a great way to keep them as it means that even the smallest city garden or balcony can accommodate them! You get to locate your olive in the best possible location regardless of soil, plus you get to take it with you if you move! The standard trunk has been expertly formed into an attractive spiral to give the tree a mature gnarled effect and makes a super decorative addition to your home or garden – plus plants have already got their first crop of olives forming on the lollipop ball of foliage so these miniature marvels look just like a bonsai version of a mature plant! 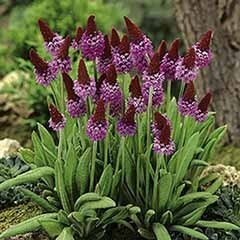 These terrific plants can be overwintered as a houseplant of you like, but we do recommend that they spend time outdoors in the summer to benefit from the summer sun. Your olive is delivered complete with a terracotta-coloured plastic pot to give them a classic Tuscan feel, making them a really nice gift to give and receive - the lucky recipient can put them straight outside or onto a bright windowsill where they give and instant Italianate look. 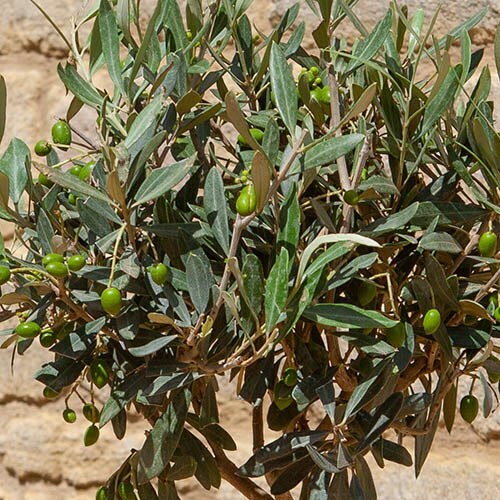 Easy to care for, plants will arrive complete with their first crop of olives on! Supplied as a 50-60cm (including pot) Patio Standard Olive with a twisted stem and already in fruit. 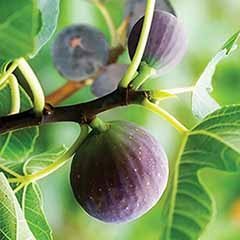 Olive tree needs the sunniest spot available in your garden and this will encourage your next crop of fruit. 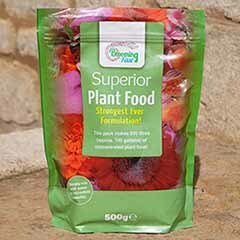 If planting in a container, use a loam-based compost such as John Innes No 3 with the addition of about 20% grit to help with drainage. 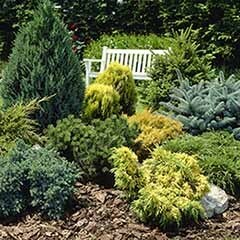 If planting in the garden, add grit to the planting hole to improve drainage. 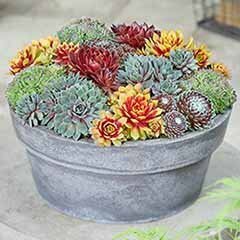 Pot grown plants should be transferred to a slightly larger pot each spring. Olive Trees are hardy but they benefit from winter protection. 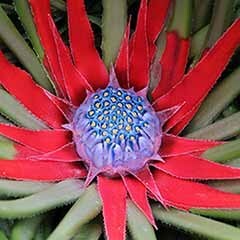 Small potted plants can be moved inside, while outside plants can be bubble-wrapped around the pot and fleece used to protect the canopy. 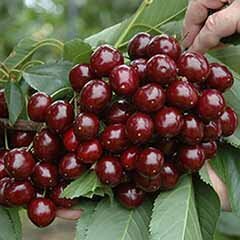 Although drought tolerant, pot-grown olives must be watered regularly and not be allowed to dry out. Clip trees occasionally to keep their shape.